SOOC is an excuse for the lazy. The question still hasn’t been answered as to whether the computer recognizes the camera as a drive letter, which is key. If it doesn’t, then it’s a USB issue (cable, port, driver, etc). If it does, then it’s a LR/SW issue. Use a card reader. Wear and tear on a card reader is no problem as it is cheap to replace. Wear and tear on the on-camera USB port is a whole other story. Is there a good reason to go to the Sony 6400 from the Sony 6000? Depends on what you want to achieve. Why distort what the camera sees? .Why not look at what nature display. Wait. Which do you want to do settle for what the camera sees or what nature displays? They are not the same thing. 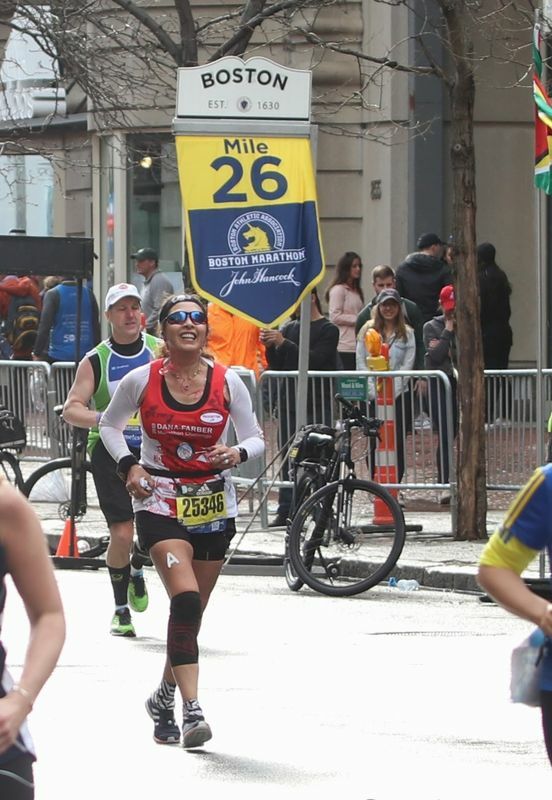 My wife completed the Boston Marathon on Monday and also completed the six majors. I have not had time to work on the files as yet. It was a long tiring trip home. The first shot is significantly cropped, but it had the 26 mile mark in the background. 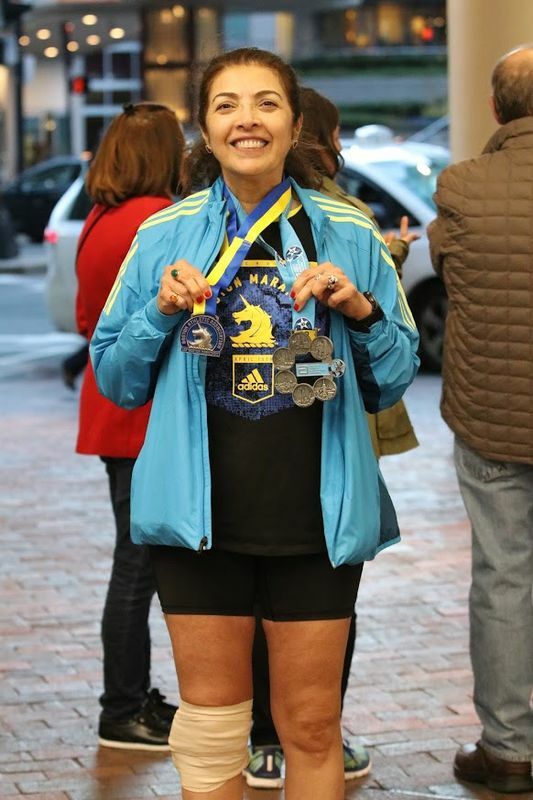 The second shows her afterward with her Boston medal, her six major medal and her bandage with ice on her knee following a post race slip. Also do not post a full res on social media. Just one that has enough resolution to look good a screen. I mean why give away the best when minimum is all that is needed. As PR it is fine. As protection it is worthless. For PR include a URL or email. The watermark is useful for when your photo has been copied and posted elsewhere. In your original post your identity is already known. If someone sees it on a repost they will be able to find you. But watermarks seem to prevent an image from going viral. Please make your topic titles more explicit. evaluating requests of high complexity tests for my city health system. I prefer to avoid it. But I thank you for showing the way. How? The syntax simply restricts the search results. It is no more risky that doing the search without it. Has anyone used the Sigma docking station? If you have do you like it? I used it with my 18-35 to adjust focus and with the 150-600 to set focus limits for birds in flight. I have also updated firmware. Do I think it is worth it? Yeah. Less focus hunting using the customization for birds and more refined micro adjustments than available in body. Given the cost of the Global lenses, I would recommend it. What Global series lens(es) do you have? This morning I got a message that said I should consider a Canon Rebel SL1, because it is a better camera then a T3i. I checked it out (on Amazon) and used ..came in white..and was a little smaller...and cheaper. Someone else also messaged me and said I should use a cellphone camera instead of going through all this trouble...soooo now I'm getting confused. The SL1 is also good. The problem with cell phone cameras is the distortion of the relatively wide angle lenses. They are OK for getting rid of stuff on ebay or Poshmark, but if this is your own work, getting a bit of distance using 18-55 lens is going to give you better results. The t3i is an excellent first camera and the kit lens should be fine for jewelry. More important for jewelry is lighting and background. You can get decent photos using natural indirect light. Depending on the piece, either a white or dark blue background will work. If you have mannequin pieces, do use them. I use the lightroom subscription. I tried to load pictures into lightroom. Some of the pictures were displayed as duplicates. By duplicates I mean the same image and the same photo number for each image was displayed. However this did not occur with all images. I attempted to complete the loading process by clicking on the "explanation mark" on each photo. I followed the steps for loading to completion. The picture would not load and the "explanation mark" remained. I tried the process more than once but was unsuccessful. Any suggestions would be greatly appreciated. There is an import option that treats JPEG and RAW files as separate files. If you shot in both, you may have selected that option. If you did, they will both display. multiply it by 1000 for others. I used duckduckgo and did not see any UHH references. I think my problem is somehow insignificant compared to the OP's worries. The same syntax appears to work in duck. Try it. How big's the medal, DS? No. I mean this is her completion of the majors. Tokyo, Berlin, Chicago, New York, London, Boston. Those are the six major marathons. She will run Berlin and Chicago again this year. 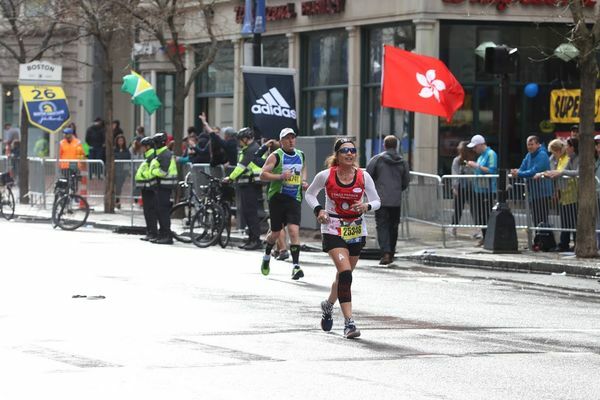 At this point she has completed 118 marathons including running 52 in under 52 weeks.